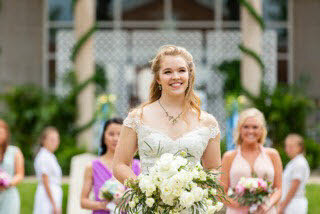 Recently graduated Girls Preparatory School senior Phoebe Mills was not only the May queen this spring, but also apparently a queen of the arts. 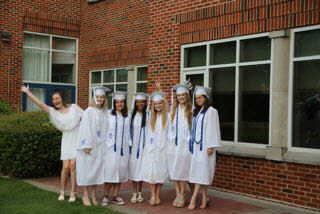 Due to her passion in art classes as an avid oil painter, her participation in the school’s Terpsichord dance troupe, and her involvement in the GPS-McCallie Candelight choir program, she was recognized during the school’s recent class day. Along with fellow graduating senior Darby Breedlove, she was presented the Fletcher Bright Award by Fine Arts department chairperson Meg P.
Brock for achieving a high degree of artistry in two or more art forms. “Art is the main thing, and singing is just something I do for fun,” she said with a smile while explaining all her interests during a recent interview at the school before she graduated. The daughter of Kathryn Mills and the late Wil Mills did a little tracing and stepping as well on the school’s front lawn on April 25 when she reigned as May queen. Miss Mills said she found out she had been named May queen back in December during a special gathering in the school’s Frierson Theatre. First the May court was voted on by the seniors, and then the entire student body elected the May queen. She admitted that she was surprisingly pleased just to be named to the court during what she said was a stressful hour-long wait before the person selected to be the queen was announced. “It was utter disbelief,” she said. “I never even considered being a May queen. It had kind of been a dream to be on the court, but even walking in with the seniors, I didn’t think I had a chance. According to school officials, the recognition – which has been around since the school’s first May Day in 1914 -- is given to a senior who best possesses such qualities as integrity, strength, self-confidence and respect for others. Excitement – at least after being selected and while waiting for May Day to arrive – might also be an unintended characteristic of a May queen. “I was very nervous, more nervous in the weeks leading up to it,” she admitted. To help her, she reached out to 2014 May queen Jess Erhart, one of at least two former May queens she had admired as a younger GPS student. 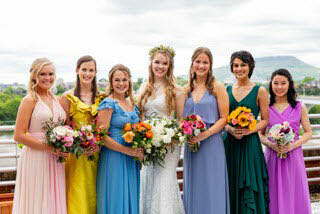 When the day arrived on April 25, all went mostly well, except for one minor problem – the long GPS-owned train would not stay attached to her wedding-style dress she had ordered. As she joked, it came off during the beginning, middle and end of her procession around the front lawn. But otherwise, the day was a positive moment in her life to date, even though the experience ended up being different than expected. Part of the reason was that, as she mentioned, she never thought she would be the May queen and figured the day would consist of being with the other seniors in a more laid-back setting. Instead, she was in a different room with the fellow members of the court. “It was a lot of ‘here’s where you go and here’s where you sit,’ ” she joked. However, she admitted that she was deeply honored to serve as May queen and tried to uphold the tradition admirably. In fact, that is one reason she was so nervous. In the weeks leading up to May Day, which in recent years has been held a little earlier than it once was due to senior exams around May 1, she had plenty of other activities to occupy her mind and avoid getting overly nervous. She had Terpsichord dance practice several days a week, despite overcoming hip surgery, and she also took art classes at the Townsend Atelier gallery downtown. She also spent plenty of time at the school painting. 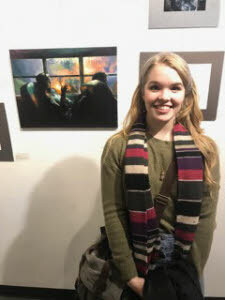 She has had some painting commissions, and her artwork was submitted by teacher Julie Deavers to a congressional competition and was placed at the U.S. Capitol. She also does portraits of her friends and others, and has enjoyed taking pictures with her camera and converting them into videos. Miss Mills has also been the subject as well as the artist. 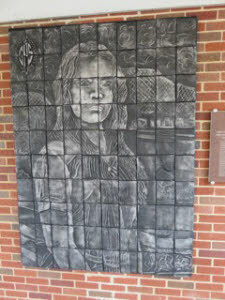 As a sophomore, she posed for the relief work, “Horizons,” that hangs at the school in the breezeway area on the north end. The students thought she might be a good subject due to her reputation as a “Renaissance woman” with multiple interests and abilities. The former Normal Park student has also become almost as skilled linguistically as artistically, as she was also a top medal recipient on a national French exam. 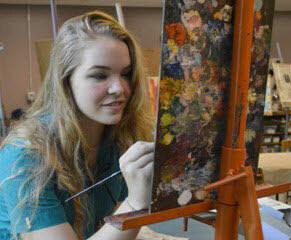 Her interest in the fine arts and foreign languages comes naturally. Her mother, Kathryn Mills, is a French professor at the University of the South at Sewanee, who learned French in a one-room schoolhouse at the age of 8 in Taize’, France. She went on to earn her PhD in French at Yale University. Phoebe, whose older brother, Benjamin, graduated from McCallie School, had first been exposed to French while living in France during her kindergarten year. Her father, Wilmer “Wil” Mills, was an accomplished poet and teacher before his death in July 2011 at the age of only 41 from liver cancer. The graduate of McCallie, who also received multiple degrees from Sewanee, also had other interests and skills, including being a carpenter. Miss Mills will be honoring her parents in a way by heading an hour or so up Interstate 24 to Sewanee to school next year. However, she admitted that was not initially her plan or goal. Due to the fact her mother is an instructor there, she will get a break on tuition. She is not sure what she will major in, but said that is a positive about attending a liberal arts school like Sewanee. “I will be exposed to a whole lot of options and I can choose,” she said. She is also not sure of a career path, but knows she wants to continue painting, whether as a vocation or just an avocation. As her very positive spring was coming to an end at GPS, she did have one minor setback when she fell and hurt her arm while enjoying her recreational hobby of hiking. As a result, she was wearing a brace during the last few days of school. But her heart for the school is still intact, and she looked back on her time there with her 101 classmates with a warm glow. How many former May queens do you know or know of? Over the years, GPS has managed a few interesting family combinations among May queens. It had the Patten twins in 1953, the three Chamberlain sisters in 1955, 1957 and 1969, and a few other sister, mother and aunt connections. May Day has also been held at a variety of locations. It was at Burnt Cabin Springs on Signal Mountain from 1914-16, from 1919-32 it was at Jackson Park (which is now part of National Cemetery), in 1933 and ’34 it was at the home of Mrs. Sim Perry Long on East Dallas Road, in 1935 it was at McCallie’s Alumni Field, and from 1936-47, it was at the University of Chattanooga’s quadrangle. It has been held at GPS every year since 1948, except in 1953, when it was at Baylor’s Rike Field during construction. In 1958, it was held in the gym due to weather, and in 1982 and ’83 it was held at the field by the river before moving back to its normal site on the front lawn. Previous GPS May queens include: Margaret Anderson Coffey, 1914; Sue Devin Smith Gooch, 1915, Lucille Thomas Williams, 1916; (No May Day, 1917 and 1918); Helen Hughes Caine, 1919; Helen Glover Miller, 1920; Dorothy Brizzie Hedges, 1921; Geraldine Thatcher Glascock, 1922; Augusta Allison Lasley, 1923; Charlotte Ferger Signiago, 1924; Sarah Robinson Sharp, 1925; Mary Sanford Patten, 1926; Martha Lanier Graham, 1927; Evelyn Allison South, 1928. Rowena Kruesi Frierson, 1929; Helen Gatewood Chenault, 1930; Elizabeth Finlay Chadwick, 1931; Charlotte Fowler Maclellan, 1932; Kate King Efurd, 1933; Mary Alice Thompson Chalfant, 1934; Marjorie Wallace Pontius, 1935; Betty Bryan Conroy, 1936; Virginia Johnson McKenzie, 1937; Betty Marus Thomas, 1938; Mary Katherine Fred Moore, 1939; Jane Brown Marlin, 1940; Hilda Hude Chapin, 1941; Mary-Claire Dorscheid Hailey, 1942; Elizabeth Carothers Gibson, 1943; Bonnie Johnson McBride, 1944; and Janet Johnston Strang, 1945. Dorris Chapin Wells, 1946; Sally McClellan Currey, 1947; Anne Cahoon Stratton, 1948; Ann Nichols Goess, 1949; Sarah Key Patten Gwynn, 1950; Sally McCoy Garland, 1951; Dorothy Brown Ellis, 1952; Charlotte Patten Gauss and Phyllis Patten Hardin, 1953; Hildagarde Reeves Sutherland, 1954; Nan Chamberlain Smith, 1955; Elizabeth Montague Lewis, 1956; Betsy Chamberlain Tuller, 1957; Grace Elizabeth Moore, 1958; Barbara Boone Stabler, 1959; Anne Dudley Griffin, 1960; Sally Bacon Smartt, 1961; Katherine Frances Kendall, 1962; Diann Estabrook Seals, 1963; and Barbara Johnson Prickett, 1964. Cynthia Kemp Battle and Suzanne Smith Allen, 1965; Helene Striebinger Reisman, 1966; Martha Smith Voght, 1967; Emily Bryan Grimes, 1968; Louise Chamberlain Tual, 1969; Allison Goree Willson, 1970; Honey Brown Doramus, 1971; Cathie Ault Kasch, 1972; Mary Rebecca Grems, 1973; Kim Lupton Strang, 1974; Eleanor Bryan Billington, 1975; Lynn Winningham, 1976; Carla Sinor Bush, 1977; Katie Lonas McKenzie, 1978; Frances Williamson McCallie, 1979; Nancy Collins Petty, 1980; Stephanie Petree Christian, 1981; Anne Duvoisin Halliburton, 1982; and Margaret Austin Curtis, 1983. Etoil Bowles Brown, 1984; Frances Sholar Clark Howard, 1985; Jana Weekes Olson, 1986; Lisa Portera Grafton, 1987; Elizabeth Rose Provence, 1988; Lesley Denise Walker, 1989; Joy Rucker Clements, 1990; Christy Leigh McArthur Moore, 1991; Janet Ensign Neder, 1992; Jeannette Rae Sebes-McDonald, 1993; Toy O’Ferrall Harmon, 1994; Florie Louise Glendenning Cook, 1995; Ayeta Sabina Mbeche, 1996; Frances Sayle Milne, 1997; Crystal Yvonne Brooks Pourciau, 1998; Amber Leigh Swafford Tucker, 1999; and Jessica Ann Cofer LaFoy, 2000. 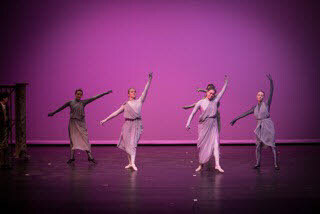 Amita Mohan Chhabra, 2001; Mary Katherine Dann Ogden, 2002; Vivian Grace Parham, 2003; Whitney Bell St. Charles, 2004; Erin Felton Lopez, 2005; Sarah Katherine Neall, 2006; Brandi Javon Andrews, 2007; Caitlin Alison McAloon, 2008; Rachel June Smith, 2009; Laura Elizabeth Laughlin, 2010; Mary Anna Caldwell, 2011; Rachel Austin Kelly, 2012; Tiana Nichole Mills, 2013; Jessica Lynn Erhart, 2014; Mackenzie Michelle Hobbs, 2015; Alyson Michelle Parris, 2016; and Iman Ali, 2017.